Cash-in-transit robbers are the most ­dangerous and violent criminals in South Africa, according to Hennie Lochner, a senior lecturer at Unisa’s department of police practice. As part of his research, Lochner ­conducted interviews with 21 criminals convicted for these crimes. “Cash-in-transit robbers believe they are the ultimate criminals,” Lochner said at a seminar hosted by the Institute of Security Studies on the subject. “Interestingly, the study found that no cash-in-transit robbery was committed on behalf of or for the financial benefit of a political party,” said Lochner. At the same seminar, Richard Phillips, the joint chief executive at Cash Connect, said one of the biggest crime issues in South Africa was cash-in-transit heists. Although the number of heists has dropped over the past decade, it was “still a serious problem”, said Phillips. Cash-in-transit robberies peaked at 467 in 2006/07 before falling to 119 in 2014/15. 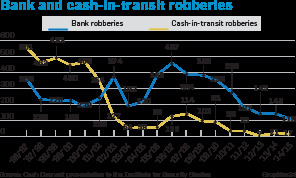 But the past 18 months have seen a reduction in ­efforts to fight cash-in-transit heists, resulting in an increase in the number of them, said Phillips. Lochner said cash-in-transit robbers planned their actions in comprehensive detail. The reasons for committing cash-in-transit robberies are financial gain, greed and the availability of huge amounts of cash. Successful heist also lead to robbers making more friends and progressing to more ­serious crimes. There is also a lot of official corruption associated with cash-in-transit robberies. Lochner said: “What struck me during the research was the ease and frequency with which state officials could be corrupted. This includes magistrates, ­prosecutors, traffic officials and police officials. “Police are mentioned as the officials that had been corrupted the most. One cash-in-transit robber [claimed to have] paid more than R1 million in bribes. “What distinguishes the cash-in-transit robber from other robbers is the way in which they plan the robbery. Nothing is overlooked and each action and plan is investigated in detail, with reconnaissance playing an important role in the planning of a robbery. “The selection of the target is not because certain companies are soft targets. They are selected according to the availability of information and the amount of money that can be stolen. “The members of the group of robbers are selected on the ­basis of their driving skills, trustworthiness and their ability to handle fire arms. According to Phillips, there is about R130 billion in cash in circulation in the local economy. About 90% of transactions in South Africa are paid for in cash and 60% of the adult population are ­unbanked, he added. “Cash transactions are the lifeblood of the economy. They are the very artery of the economy,” said ­Phillips. Technology in the cash-in-transit sector had evolved since the 1990s in response to the increasing number of armed and sophisticated criminals. Fixed-wing aircraft and helicopters were even used to move cash in rural areas, he added. “At one point, there wasn’t a month when I didn’t attend the funeral of a guard. These are sophisticated criminals who are well organised and have resources,” said Phillips. Another tactic the cash-in-transit sector began ­employing, according to Phillips, was reducing the ­volumes of cash moved; and cash-in-transit staff were given combat-ready training. Phillips said the “greatest threat” to the cash-in­transit sector was the pricing of its service, which had decreased in real terms. repulse heists, criminals moved to attack softer targets, resulting in an increase in business robberies. “About 90% of the attacks on businesses were in pursuit of cash,” said Phillips. Business burglaries and bombings increased from 58 438 in 2006/07 to 74 358 in 2014/15, while business robberies shot up from 14 534 in 2009/10 to 19 170 in 2014/15. Another trend Phillips identified was the proliferation of cash machines, which were highly vulnerable to cash crimes. “Organised crime is attacking our economy,” he said.